Whether the project is for a new gas appliance or you are building an entire house, planning is essential. We want to make sure that the gas that feeds your appliances is at the right pressure and in the right location without a lot of excess material – translating into a cost-effective installation for you. 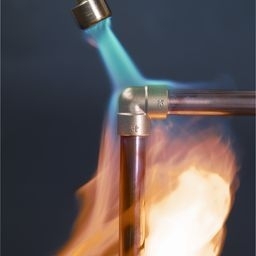 When running new gas lines it is important to consider safety and the ultimate performance of the system. R&B has an excellent working knowledge of Gas Safety Codes and how to deliver the gas to your appliances for optimum performance. With several years experience, any of the Class B certified journeymen gas fitters on R&B’s staff will ensure the job is being done right. R&B works with contractors and homeowners on a gas project from the planning stage through to the testing, inspection, and finish. With a project quote, your project will be on time and on budget. Licensed, bonded and insured. Converting to gas? Let us be your installer for this new gas line. Although gas lines run through the city, some homes don’t access it beyond the furnace. When considering a new installation or conversion of your existing appliances, let us be your chosen installer for the project. Great job.... great tech. Most impressed with Malcolm's work and more generally your company.